If you wish to improve your operating system so it would run in a smoother way, you must know that a program called K9-PCFixer is not an application that should be trusted entirely. During the research our team has found out that this optimization tool works in a questionable way; thus, it has been classified as a potentially unwanted program. Another major reason this suspicious program is categorized this way is a questionable distribution of this optimization tool. 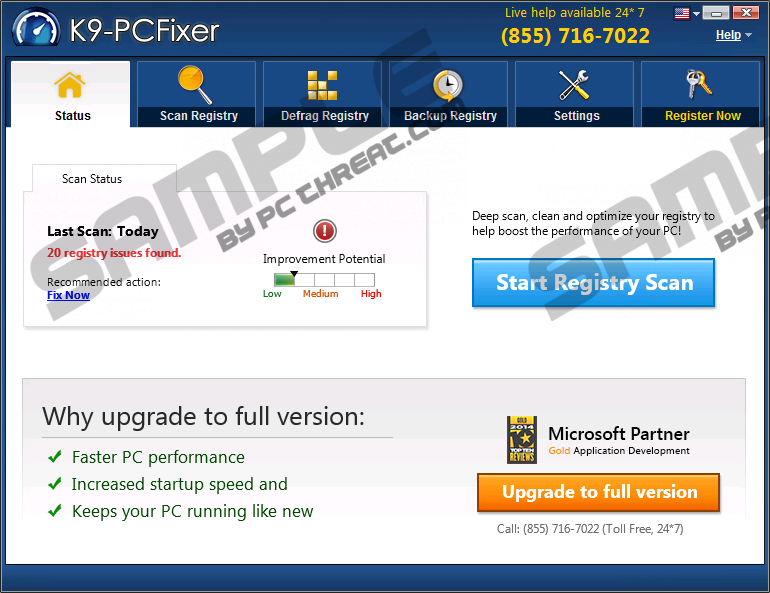 It is worth noting that K9-PCFixer is not something that we would recommend since it holds a few if any at all valuable features. Thus, due to all of this we firmly believe that it should be removed from your PC without any hesitation as it will not serve you in a good way. Read the rest of this article and learn how you can delete K9-PCFixer in a quick and easy way. Once this suspicious optimization tool is up and running on your operating system, it will almost immediately start a system scan. The scan is quick and looks like a legitimate one. Once it is over you will be provided with an extensive list of errors that allegedly are causing your system to run slower. An everyday user would not be able to tell that the result list includes some rather questionable errors, to say the least. During the research our team has discovered that this suspicious optimization tool picks up inactive registry entries and various temporary files, which, in fact, do not affect your PC in a negative or positive way as errors. This is probably used as a scare tactic to lure everyday users into purchasing the full version of K9-PCFixer since it is the only way to fix the alleged errors. We firmly advise you not to waste your money on this questionable program. You must know that there are much better optimization tools that should be used instead of K9-PCFixer. In fact, we believe, that this suspicious program should be removed from your PC as it serves no good whatsoever. Another major reason K9-PCFixer is classified as a potentially unwanted program is its questionable distribution. Even though it is possible to download this optimization tool from its official website it is important to note that in quite a few cases this suspicious program could be spread via software bundles. This way of distribution is often used by cyber crooks to spread their questionable software. Therefore, you are highly advised to check your PC for other controversial programs if you have found K9-PCFixer active on your PC. Your best bet to reduce the risk of getting your PC infected with suspicious programs is to implement a professional antimalware tool since it provides overall system security at all times. The removal procedure should be executed as soon as possible as it serves you no good. It is important to carry out the removal process with your utmost attention as in some cases it has been seen that some traces of K9-PCFixer could still be active if the removal procedure was not executed carefully. To be sure that every single bit of K9-PCFixer has been removed from your operating system, you are firmly advised to scan your operating system with a professional antimalware tool as soon as manual removal is executed. Tap the Windows key located on your keyboard. Double-click K9-PCFixer and confirm that you want to remove it. Quick & tested solution for K9-PCFixer removal.